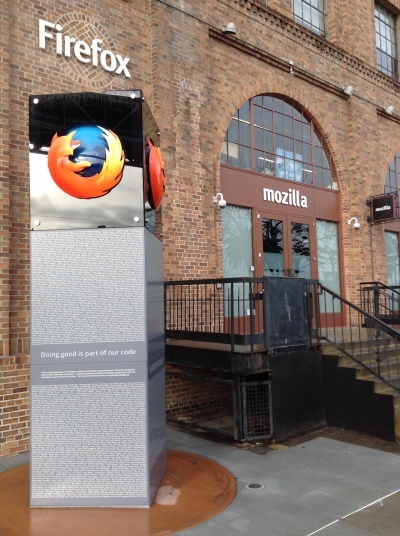 Mozilla has a San Francisco office! This page has information about it. Enter the building from the entrance lobby on the Embarcadero (as pictured), just a few steps from its intersection with Harrison Street (NW corner between Harrison & Folsom). Mozilla has space on the 1st, 2nd, 3rd, and 7th floors. Walk South on Spear street to Harrison st. Walk East on Harrison st. to the Embarcadero, but don't cross. Turn left onto Embarcadero, immediately walk up the stairs to the 1st floor entrance. Or use the wheelchair lift if you need it, right next to the stairs on Embarcadero. There is a doorbell and intercom! Walk South on the stop to Harrison st.
Beware of trains and traffic! Alternatively, take any MUNI line to Embarcadero station and follow the BART instructions from street level. Take BART to Embarcadero station, follow BART instructions above. If you need to use the elevator to go from the 1st to the 2nd floor please see the SF receptionist, who can unlock it between the hours of 8:30am-5:00pm Monday through Friday. If the receptionist is not available, please use the main building elevators. If you need to use the elevator outside normal business hours please contact [wpr at mozila.com] to make arrangements in advance. If you are visiting the office to attend a group event, there are a few different places where they might be held. The Commons is a public space where the Weekly All Hands meetings, brown bags and other community events are held. This is in the middle on the right side of the floor plan. Behind the Commons, in the upper right part of the floor plan document, there is another space that is sometimes used for community events. Mixt Greens - on Mission just East of Spear. Excellent salads both preconfigured and BTO. Tuesdays and Thursdays there's the Farmers Market and various food stalls are setup out front for more options. YMCA is nearby, 5minute walk, and even has a swimming pool. BART to 16th st. & Mission st. Walk 3 full blocks South on Mission st. from 16th st. to 19th st. Walk 3 full blocks East on 19th st. to Harrison st.
Mission Cliffs is in front of you. outside Mozilla office, on Embarcadero, get on Muni platform. As you look at the bay, with your back to the office, you want trams going to your right. get on KT tram (towards Visitacion Valley / 3rd Street). $2 exact change required. Journey takes ~10mins. get off at 23rd and 3rd street. on 3rd street, walk to mid-block between 22nd-and-23rd-street. Its a big gray industrial building with large red "2565" painted on the wall near the door. Dialin as #309. Walk up to the 3rd floor and follow the aikido signs. This page was last modified on 24 May 2016, at 18:15.